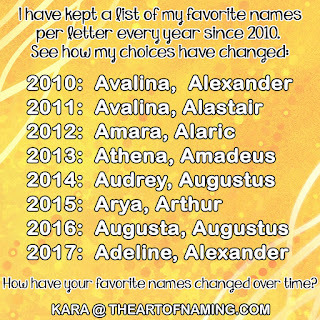 I thought it would be nice to see what the top 10 names are for every letter. Perhaps you know that you want a name that starts with the letter C for all of your children but you don't want to choose the three most popular C-names. Now you can see exactly how popular each name is per letter as well as overall in ranking according to the US Top 1000 chart (ranking in parenthesis). There were some letters that were more difficult than others. If any of the numbers in parenthesis exceeded 2000, they may or may not be 100% accurate. I had to look up individual names to see where they may rank, put them in a list with other looked-up names until I couldn't find any more. Then I took the top 10 that I could find. It is possible that a name or two fell through the cracks. If you find an error or a missing name, please let me know so I can fix it. This is as accurate as I could possibly find in my research. Which letter is your favorite? For shareable graphics for each letter, visit our Pinterest Page!